A somewhat similar discovery was made at Stembrook in 1955 when excavations were made for the basement of the new car showrooms and other premises built fronting Church Street and Castle Street. In this case large pieces of timber, about 20 feet down, appeared to have been fastened together with iron staples. If this too was an old quay, which it certainly appeared to be, it would have been on the opposite bank of the river to that found in St. James’s Street, thus throwing some doubt on the suggestion that the latter was specially built for the landing of stone for the castle Keep. The find at Stembrook caused the brewers to name their new public house in Church Street the "Roman Quay." Clear evidence was also found at Stembrook in 1955 that in early times the Dour estuary covered this spot. A year or two earlier traces of a sandy beach were found when excavating for the new shops, with flats above, built on the east side of the Market Square. The upper part of St. James’s Street, which was wide, was flanked by good houses, most of which appeared to have been re-built within the past 270 years. There were some older, whilst others were re-built about the end of the 19th Century. The “Fox“ Inn was a very old victualling house; and some of the houses above it, with their slightly-bowed fronts, were of the style that was in vogue in the time of George II. St. James’s Schools, on the north side of the street, had a rather antiquated look, but they were built in the year 1849. Up to that time, the Charity Schools in Queen Street had not been regarded as a parish affair, having been used generally by the whole town; but the need for more accommodation was pressing, more especially because the Queen Street Schools did not take children under eight years of age. The effort to provide special accommodation for St. James’s Parish met with very generous support from Miss M. Winthrop, who purchased the ground on which the school was built and gave a very liberal donation to the building fund. Tenders for building these schools were invited in July, 1848, and a few weeks later, at a meeting, presided over by Sir Francis Cockburn, in the vestry of the Parish Church, six tenders were received, and that of Mr Parker Ayers was accepted, the amount being £1,310. The work was to have been completed on the 1st December, 1848; but circumstances, which appeared to be beyond control, delayed the opening of the schools until 11th June, 1849, when the Rev. Thomas Morris, the Rector, performed the opening ceremony. The schools had a wing built on the west side in 1906. Adjoining the schools, on the upper side, was a substantial house, which was once the residence of the Misses Bazely, members of an old Dover family. After their occupancy it was, for many years, the premises of the Dover Trained Nurses’ Institute. A little higher up there used to be visible the date 1759, on the front of No. 19, but that house and No. 21 were demolished to provide a site for St James’s Parish Hall, which had a handsome frontage, yet so designed as not to be out of harmony with the old-world features of the thoroughfare. At No. 19, Mr Austen Jarvist, the stonemason, for many years carried on his handicraft. He sculptured a marble bust of the Duke of Wellington, 2ft. 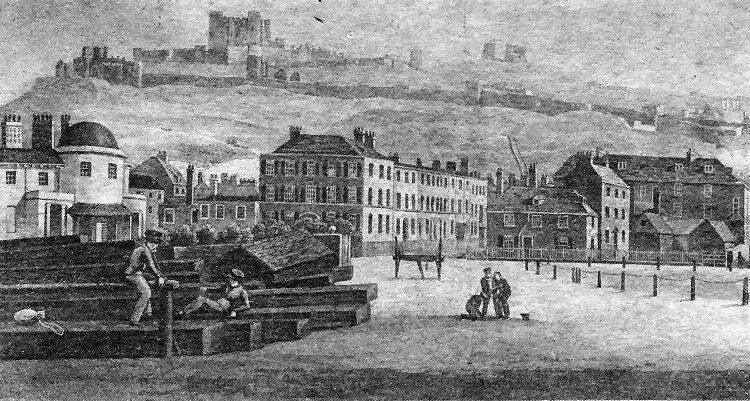 high, which was much admired when exhibited at Dover in 1847. As an apprentice, in 1812, he re-cut the inscription on Churchill's tombstone in old St Martin’s Churchyard, and he re-cut it not long before he died, in 1862. Street improvements before the turn of the century made a clearance of some of the oldest houses at the top of the street. Nos. 1 and 3 disappeared from the north side; both were very old, and in No. 1 was a stone on which was cut the letters “HIM.,“ and the date 1666. No. 1 was well known as Mr Brett's bun shop, and when it was pulled down, during the street widening of 1894, the stone was saved, and built into the garden wall of Castle Hill House, close to the same spot. The initials “H.I.M“ were those of the original owner of the demolished property, and the figures, it is presumed, record the date of its erection. Over 170 years ago when Castle Hill House was the residence of Mr Stringer, the grounds on the St. James’s Street side were occupied by the house of Mr Horn, which continued the line of houses, on that side, so near to the "White Horse“ Inn that it was difficult for the Deal coach to turn the corner. Two houses also went from the South Side at the top of the street. The first one was St. James’s Parsonage. It stood at the top of the street, so near to the door of the church, that the roadway seaward was very narrow. This parsonage, which was taken down in 1856, was built in 1786, during the time of the Rev. Thomas Tournay, Rector (son of Mr Tournay, of Brockhill, Saltwood); but there had been, on the same site, a parsonage that dated from the reign of Henry VII. The other house at the top of St. James’s Street, the residence of Dr. Parsons, was removed in 1894, when Woolcomber Street was widened. The old parish church stands at the top of St James’s Street. The ancient edifice was used as a chapel-of-ease for the parish when this book was first published in 1907, but after 1918 services were only held occasionally. It was in an excellent state of preservation before the last war, when the church was severely damaged, having been restored in 1869. The tower was restored again in 1931. It is not definitely known when the church was built. It did not exist at the Conquest, but it was built before 1291; therefore, it may be ascribed to the Norman period, of which the style of its architecture affords corroborative evidence. Originally, it consisted of only a nave and a chancel, the building on the south side having been added at an early date, to be used as the Courts of Admiralty and Chancery of the Cinque Ports. A great deal of business was done in that old court house; the last sitting of the Court of Admiralty there was on September 1, 1863. The Court of Lode-manage, which dealt with the Cinque Ports Pilots and their licensing, also met here, the last such court being held on October 21, 1851, when the Duke of Wellington presided. Today we know the area as Townwall Street but when these properties were built, in the early part of the 19th century, it was known as Warden Down. Here, before the Dour estuary silted up, was the old port of Dover. This 1830 view, with Shipdem's House, with a curious domed roof, on the left, is described as the “New Town.“ The other top view of about the same date depicts Shipdem’s home more clearly and with a peculiar crane-like device in front.